Auto-Feed Rivet Insertion Tools are the ideal choice in high-volume production environments where speed and ease-of-use are critical elements of cost control and throughput efficiency. The auto-feed design significantly increases the quantity of rivets that can be installed within a given time period. They also greatly reduce the effects of operator fatigue that can sometimes be associated with use of manual tools. These tools can be successfully deployed in a wide range of industrial applications. 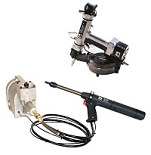 JHP Fasteners offers a wide range of auto-feed rivet tools; all of which are constructed from high quality materials to ensure optimum performance and reliability. Park # RK-4500KS5 – rivet sizes - 1/8" & 5/32"
Part # RK-4500KS6 – rivet size - 3/16"
The KingSet uses standard production rivets, machine loaded onto a plastic strip. Using off the shelf rivets keeps costs low and also allows for the occasional hand fed rivet when the situation arises. KingSet tools have helped fabricators streamline the assembly of appliances, automotive products and electronic chassis around the globe. 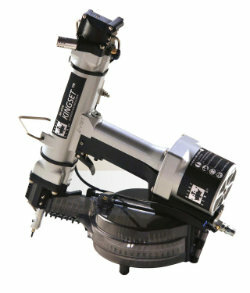 When you choose KingSet, JHP Fasteners in conjunction with Industrial Rivet’s Application Engineers will conduct an in-depth evaluation of your operations and make recommendations on how this automated, handheld tool can best work in your environment. Simply put, JHP Fasteners and Industrial Rivet will be there to guide you through the application process and will continue to be there long after you adopt and implement this tool. Did we mention it’s flexible? You can easily negotiate the KingSet tool around a large assembly with nothing holding you back but the length of your airline. You’re not tied to bulky add-ons for every rivet you put in. You don’t have a mile long mylar tape to get tangled up while you’re trying to work. It just works, when you want and wherever you want it to. If you are involved in semi or full production riveting you should really give the KingSet a serious look. It’s proven technology that can save you both time and money. Please contact us directly so we can help you determine if this tool is right for your application. If this tool fits your needs we would be happy to setup a demonstration at your facility and test it on your parts. For rivet assembly applications that require speed, accuracy, and labor cost control, the use of an auto-feed rivet insertion tool is the clear choice within many industrial production environments. These tools provide high production capacity along with a clean and ergonomically robust process approach. We invite you to take advantage of our broad range of industry experience and expertise. Based on your input, we will be able to provide you with expert guidance on the choice of the most appropriate type of tooling to meet the requirements of your specific project or application. Excellent customer service, a broad product offering, and competitive pricing are just a few of the tangible benefits of doing business with JHP Fasteners. 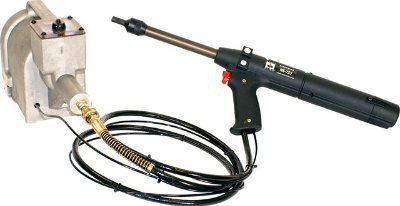 With a cycle time of only 1-2 seconds, this is one of the best options available for semi-automatic rivet installation. Combined with low operator fatigue and a quick magazine reload time, you can dramatically increase production over conventional riveting tools. Available in several different mounting configurations. 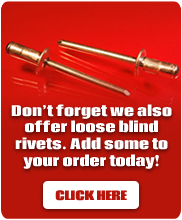 Rivets are supplied in magazine form which rivets are easily loaded into the riveting handle. Rivet installation speed of up to 1 rivet per second. The RK-753 uses special rivets, machine loaded onto a disposable paper strip. Although these rivets do not provide the same level of fastening strength as a standard rivet, they compensate for that with a low profile and ease of installation. The Quickriveting system is all about speed. You can install rivets as fast as the nose of the tool can find the next hole. With the handheld portion weighing in at only 2.37 lbs. and sporting a comfortable pistol grip, you can install rivets for hours while experiencing little fatigue when compared with other standard rivet tools. The RK-753 Quickriveting tool has helped fabricators streamline the assembly of light and medium duty assemblies the world over. When you choose the RK-753, JHP Fasteners in conjunction with Industrial Rivet’s Application Engineers will conduct an in-depth evaluation of your operations and make recommendations on how this automated, handheld tool can best work in your environment. Simply put, JHP Fasteners and Industrial Rivet will be there to guide you through the application process and will continue to be there long after you adopt and implement this tool. If you are involved in the semi or full production riveting of light to medium duty components, you should really give the RK-753 Quickriveting tool a serious look. It’s proven technology that can save you both time and money. Please contact us directly so we can help you determine if this tool is right for your application. If this tool fits your needs we would be happy to set up a demonstration at your facility and test it on your parts.